How does Calvary support their missionaries? How do I become a Calvary missionary? If I am not called to be a full-time missionary, is there another way I can be involved in Reach Global? Learn the answers to these questions and many more by reading the sections below. How is the Reach Global Program prepared? Who is on the Missions Ministry Team and Staff? What are some ways to see Reach Global at Calvary? How can we pray for Missionaries? How can I stay up to date with Missionaries? How can I stay up to date with everything else global? Staying or going? Where is God calling you? What are specific requirements for Calvary Missionaries? The Reach Global Missions Ministry Team, (hereafter known as MMT), is responsible for the oversight of the Reach Global Missions program of Calvary Church. Reach Global Missions is crossing the cultural and/or geographical boundaries outside the influence of the local church and sharing Christ with people not like you. The Reach Global Missions Director, Reach Pastor, and Missions Elder/Chairman form the MMT made up of six to eight men and women, with passion for seeing people come to Christ - from every nation, tongue, and tribe. These MMT members are approved by the Elder Board, after being selected from our church membership based on previous missions experience, spiritual giftedness, and a willingness to be part of a working team. The members commit to serving a minimum of one year in their role overseeing a committee or function of the Reach Global Missions program. When needed, sub-committees are formed to help broaden and strengthen new decisions made regarding policies, programs, or finances. In conclusion, the MMT seeks God’s will in all things - through prayer, reliance on the Scriptures, and additional wise counsel as they seek ways to challenge our congregation to become more personally involved in the Great Commission and to pray, give, and go. Each year in March and again in October, expert speakers challenge and encourage you with what is happening globally in missions and ways for you to get involved. This is also the time to meet some of our Calvary missionaries who join us during these times. On most second Sundays of the month, there is a special time of focus on missions in both the Celebration and Elevation services. Through media, missionary interviews, and other means we hope to bring an awareness of what is happening in missions around the world and generate a passion for the lost. As our Calvary missionaries are sometimes in Orange County, either for short visits or home assignment, we try to provide opportunities for them to share about their ministry. One of those times is during our Meet & Greets, which usually take place on Sunday mornings at 8:45am in W-209. As opportunities arise we make them known through the Calvary web page and also by email to those who are on our Missions interest list. You can sign up for that email by contacting Lynn Ahern at . At the Meet & Greet we have a short time of fellowship with refreshments, the missionaries featured share for about 30 minutes, and then there is a time of Q & A. Meets & Greets will be about four or five times a year. Mission representatives in Sunday Morning LifeGroups encourage members in active participation of God’s work around the world through missions education (missionary speakers, videos, books), missionary care, and missions participation. Each Sunday Morning LifeGroup is assigned their own Calvary missionaries and is encouraged to be actively involved in their ministries through prayer and correspondence. When possible, after arriving home or returning from the field, missionaries are interviewed and prayed for in the monthly Missions Ministry Team meetings. In addition, missionaries share in other venues including speaking in LifeGroups, WWAM, and Men’s and Women’s Bible studies. Calvary Christian School also has Calvary missionaries share in their chapels and classrooms throughout the year. On some Sundays in the Worship services missionaries are interviewed. Following our Summer Short Term Missions Teams’ and individuals’ mission trips, we have special times for reporting back what God did through those individuals who went on mission trips. Watch the web page and the Calvary Current for specific dates and times. New Long Term (career) Calvary missionaries are commissioned and prayed for by the Elders prior to their departure. This usually happens as part of our Sunday morning services during Reach Global Missions Week or Mission Emphasis Weekend. A time of prayer for our Short Term Missions Teams takes place when possible in the morning worship services or as they meet together just prior to the team’s departure. Children’s Sunday programs connect with their missionaries by praying for and having pictures of our MKs (Missionary Kids) that are in their same age group. Each summer, a missionary family is asked to share for the week at Calvary’s Vacation Bible School program. The children hear from this family throughout the week and save pennies that will be used to purchase something for their ministry. Renovación for Spanish speakers, and Logos Bible Church, for Mandarin speakers, both offer Sunday morning worship services and adult study classes, as well as mid-week events and studies. Renovación is a ministry of Calvary Church, with Pastor Armando Reyes on Calvary’s pastoral staff. An elder from the ministry also sits on the Calvary Elder Board. The Logos Bible Church is independent from Calvary Church and their Pastor Andy Chao leads services each week for mainly first generation Chinese who are here from mainland China or Taiwan. Missionary News & Prayer published is a synopsis of our missionary correspondence and prayer requests received by the Reach Global office. Use this to keep up to date with what is happening around the world as well as a guide to help you pray faithfully for those requests. Also upcoming missionary birthdays and anniversaries are noted. Pick up a copy each Sunday morning in the Worship Center lobby, Sunday morning LifeGroups, or in the Reach office during the week. The Reach Global Contact Info is updated monthly and contains the addresses, phone and emails of Calvary missionaries. Also included are the birthdays and anniversaries of the families. This booklet is available the first Sunday of the month. Pick one up and email, write or send anniversary or birthday greetings to a Calvary missionary today! They are available in the Reach Ministries office on week days or on Sundays in the Worship Center lobby or the Sunday Morning LifeGroups. The Missionary Prayer Guides are updated each year with a write-up on each of our Calvary missionaries. Included are pictures and trivia information. In addition, our monthly supported agency partners are included for prayer. These guides come out in March and are available in the Reach Ministries office on week days or on Sundays from the Worship Center lobby or the Sunday Morning LifeGroups. For more information about each of our Calvary Missionary families, pick up a copy of the Missionary Prayer Guide updated and available each March during Reach Global Missions Week. Pray effectively for your missionaries by picking up a copy of the Missionary News & Prayer produced weekly with a synopsis of letters and/or emails and prayer requests from our missionaries and missions partners. Available in the Worship Center lobby or in the Reach Ministries office. Calvary supported missionaries serve under agencies having a reputation for integrity and stability, whose Doctrinal statements Church Statement of Faith; who are sound and open in their financial policies and practices; who demonstrate good management; and whose missionaries are given thoughtful direction. We believe that missionaries are more effective when working under an established missions agency; therefore it is not our policy to support missionaries who are independent of such sponsorship and direction. In addition, if a current missionary leaves a solid agency and considers one that lacks accountability or disagrees with the integrity or stability of a sound agency, this would be grounds to remove the missionary from our role. We attempt to be assured of the personal integrity of the candidates; that they are acting in the will of God; that their ministry will be fruitful; and that they are capable of handling the task to which they have been called. It is expected that all missionaries will have personal evangelism and discipleship outreach. An effective ministry in people's lives in a local church context and successful experience in evangelism and discipleship should already be evident in the candidate's ministry while preparing for the field. The Missions Ministry Team desires that all missionaries have the same standards as the pastoral staff of Calvary Church, whether assigned to home or foreign missionary service. We expect all of our missionary personnel to have the same witness, to work in the Spirit of God and to be men and women of conviction, as we do Calvary Church staff. Like members of the Calvary Church staff, they will be released of their Calvary missionary role for heresy, immorality, and/or disloyalty. Criticism of Calvary Church, its policies, pastors/directors or staff members is not a luxury granted to those who receive support from Calvary Church. When there is a question or criticism, it should be directed to the individual involved. If this is not satisfactory, then it should be taken to the Reach Global Missions Director, the Reach Pastor, the Personnel Committee Chairman, and/or the Missions Ministry Team as a whole. The Missions Ministry Team wants to be assured of the personal integrity of our candidates; that they are acting in the will of God; that their ministry will be fruitful; and that they are capable of handling the task to which they have been called. For this reason, we prefer some significant participation with Calvary Church before undertaking support. This allows us to observe the candidate in day-to-day life and ministry. An effective ministry in people's lives and successful experience in evangelism and discipleship should be evident. Calvary Church Missions desires to provide for each missionary Prayer Partners from within our own church family. You choose the missionary and develop a more intimate relationship in your own way: group socials, projects, and prayer or individual prayer. For more information, contact 71.550.2341. In addition, each of Calvary's LifeGroups are assigned missionaries that they pray for on a regular basis. The missionaries are encouraged to meet with their LifeGroups when they are in town. Beyond "God Bless our Missionaries"
1. It is not necessary that you ask God to give us good health. The important thing is that He gives us the measure of health that will best glorify Him. 2. We do not want you to pray that God will give us an easy path on the mission field and remove obstacles. Rather pray that He gives strength and grace to overcome for Him. 3. It is not so important that you pray that God should bless our activities. Ask that He censor our activities, for it is easy for time and energy to be spent on second-best things. 4. Pray that, like the Apostle Paul, we may be willing to deny ourselves in order to make our lives an example to the unbelievers. Sometimes this means forfeiting rights, privileges, and material conveniences we have taken for granted all our lives, but which are stumbling blocks to missionary service. 5. Do not pray for us as though we live on a higher plain. We can become lonely, discouraged, irritable and impatient, and we can do a lot of missionary work simply in the energy of the flesh. Pray that the love of Christ may constrain us in all that we do. 2. They would have clarity in preaching the Gospel. 4. They would know how to divide their time (between reaching and working with the masses, preparation of sermons or programs and working one on one with a few key people). 6. The development of national leadership and vision so that the people can reach their people with the Gospel. 7. They would know how their role should change in order to reach a country for Christ. 8. They would have unconditional love for all people. 6. Pray that we will be faithful stewards of our God-given gifts. (1Tim 4:14). 7. Pray that we will watch closely our lives and doctrine. 8. Pray that we will relate properly to younger and older women and men. (1 Tim. 5:1-16). 9. Pray that we will be impartial and not show favoritism. 10. Pray that we will keep ourselves pure. (1 Tim. 5:22). 11. Pray that we will are for ourselves physically, as well as spiritually. (1 Tim. 5:23). 12. Pray that we will be content with what God has given us. (1 Tim 6:6-10). 13. Pray that we will strive after righteousness, godliness, faith, love, endurance and gentleness. (1 Tim. 6:11). 14. Pray that we will fight the good fight of faith. 15. Pray that we will guard what God has entrusted in our care. (1Tim.6:20). 17. Pray that we will strengthen ourselves in the grace of our Lord Jesus. (2 Tim. 2:1). 18. Pray that we will be able to disciple other men. 20. Pray that we will do our best to handle correctly the word of truth. (2 Tim. 2:15). 22. Pray that we will flee evil desires of youth. (2 Tim. 2:22). 25. Pray that we will continue in what we have learned and become convinced of. (2 Tim 3:14). 26. Pray that we will never undermine the sufficiency of God's holy Word. (2 Tim. 3:16). 28. Pray that we will carefully correct, rebuke and encourage with great patience. (2 Tim 4:2). 29. Pray that we will keep our head in all situations, endure hardship, do the work of an evangelist and discharge all the duties of our ministries. (2 Tim. 4:5). 30. Pray that one day we will be able to say, "I have fought the good fight, I have finished the race, I have kept the faith. (2 Tim. 4:7). The REACH Magazine takes you around the world and right here in your own neighborhood with stories that will challenge and inform you. Published twice a year, this is one way we share information about our Reach Global Mission program and Reach Local outreach. Read about our new missionaries, Short Term trips, many upcoming opportunities for ministry service, and reports of how Calvary Church is helping reach Orange County and the World with the Good News of Jesus Christ! Great books on Global missions and missionaries are available at The Corner, Calvary’s bookstore, including several written by or about our Calvary missionaries. The church Library and Reach Ministries office also have books and DVDs that are available for loan. Click here for more information on our Calvary Church Missionaries, agencies, Short Term trip updates, March Reach Global Missions Week and Missions Emphasis Sunday, Guest Helpers, WWAM, and lots more. Check it out regularly for new information. Most of the listed resources are available in the Reach Ministries office on week days or on Sundays from the Worship Center lobby or the Sunday Morning LifeGroups. Could you provide our Calvary missionaries with free or discounted services: medical care, legal aid, accounting services, airline miles, auto repair, temporary or long term housing, piano lessons, or car use? Contact Jill Nielsen, in the Reach Ministries office if you can help. All information is kept confidential. 9 a.m. and 7 p.m. (childcare available in the morning). Meeting with Calvary missionaries as they share their experiences, you’ll share in their joys, challenges, and sorrows, and learn to pray with a greater understanding. For more information contact Lynn Ahern, at in the Reach Ministries office. Seminars, workshops and classes are offered throughout the year. You will discover how to share your faith, without offending, and yet get the salvation Message to your neighbors and those you are in contact with daily who believe differently from you. Watch the website and the Calvary Quarterly for class dates and times. Individuals who are interested in missions and how to use their gifts to reach the world are invited to be a part of our Future Missionary Focus program. An initial meeting to go over the handbook, fill out an application, and ask questions allows each person a chance to begin the process. Those individuals who decide to commit to this process are placed with a mentor who will work with them for accountability on their progress. Contact Liz at to being the process. Short Term Mission Teams consist of a minimum of four people who serve out of the USA in a missions experience of two to three weeks, enabling them to participate in cross-cultural ministry. All short term trips must be approved by the Missions Team. Most trips work in conjunction with Calvary missionaries and/or ministry partners. Contact Liz at for more information. People with handyman experience or at least a desire to learn, are encouraged to become a Guest Helper. This group accepts requests from our missionaries (both stateside and overseas) as well as other ministries, to come alongside to repair, restore, or build projects related to the work as well as minister to the missionary by their visit. Contact Bob VanderWall at to get connected. This is often a good first step when considering missionary service in your future. Individuals considering going on a short term trip may submit a request for one time financial help from the Missions Ministry Team. Call the Reach Global Ministries at 714-550-2341 for more information and an application form. 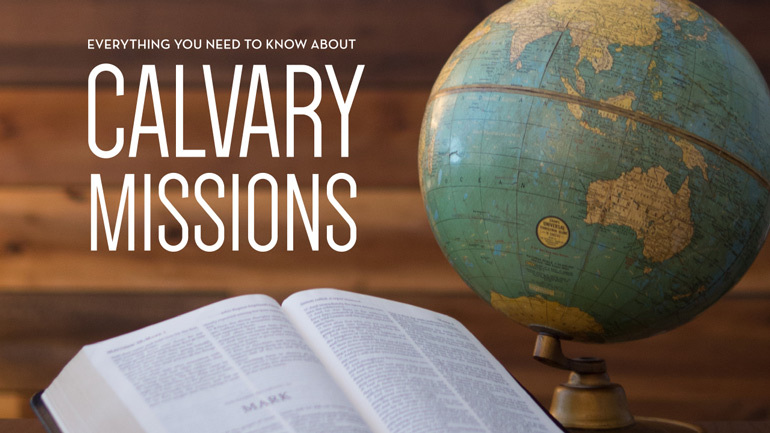 Calvary missionaries are ambassadors of Calvary Church, and must first go through the Discover Class, be interviewed by an Elder, approved for membership, and be actively involved at Calvary Church, before being considered for the missionary application process. Active participation in Calvary’s Future Missionary Focus program and other ministries of the church, as well as a working relationship with the Missions Ministry Team are necessary steps in the process. Members interested in becoming a Calvary missionary should contact Liz Gold, Reach Global Missions Director at and also become familiar with the Calvary Church Global Missions Policy. We support missionaries on a monthly basis through the Faith Promise gifts the people of Calvary give throughout the year. Missionaries are supported at various monthly levels based on where they are serving, their length and type of service, and financial considerations. In all cases, Calvary does not totally support the missionary. All of our missionaries are encouraged to have three to four other churches and a minimum of 40 individual supporters to help make this happen. In addition to the monthly support, Calvary sets aside and distributes to our missionaries special care in the areas of scholarships and gifts, emergency financial support, travel expenses, re-entry gifts for those on furlough, outgoing help for new missionaries leaving for the field, housing and other support as possible. Calvary Church supported missionaries may not actively solicit additional support from individuals or groups in the church body. With so many missionaries, our members would be bombarded with financial requests. Prayer letters may be sent to friends within Calvary Church as long as the letter does not include appeals for support. A stated need is not considered an appeal. Instead, supported missionaries should direct all additional needs to the attention of the Reach Global Missions Director, Reach Pastor, Missions Elder Chairman, or a Missions Ministry Team member. Calvary Church supported missionaries are expected to visit our church at least once during a regular home assignment. The missionary should meet with the Missions Ministry Team for an oral debriefing of their ministry at least once every five years. This allows us to stay involved in each missionary's ministry as well as give input into decisions, concerns, and future plans. The Reach Global Missions Director will meet with the missionaries whenever there is an opportune time, be it a short visit by the missionary here to Orange County or a visit by the Reach Global Missions Director to the missionary's ministry field location. All missionaries are required to correspond regularly with the Calvary Church body and the Missions Ministry Team to inform them of their activities and prayer needs. One form of written correspondence every two months is considered minimum to enable to Missions Ministry Team to adequately serve the missionaries and keep the congregation informed. This can be in the form of a hand written or typed letter, email, phone call or Skype. All missionaries are required to fill out and return to the Reach Global Missions Director the Annual Missionary Questionnaire on their past year's ministry and yearly financial support in order to keep our records up to date.